Hairy Maclary is feeling playful and frisky. He is busy chasing and bustling the neighbourhood cats. He is confident, having gotten the best of so many, when he runs into the one cat he really didn’t want to meet. 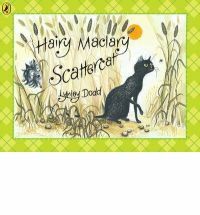 Another enjoyable addition to the Hairy Maclary series. It is closer in style to the first book text wise – with a small amount of rhyming text and some repetition. There are the same trademark illustrations though this time Hairy is hiding in some of the pictures, can you find him? As with the other Hairy Maclary books I had fun reading this out loud.